I scroll endlessly between the two options: dark green or dark grey? Which pair of boots will be better? (I really wanted patent black, but they didn’t have it). Grey will do. Grey will be good. It will be better than patent black, really. It will be more wearable. Do I really need these boots? Most days I am actually okay about being ill; I kind of accept it and get on with life. It doesn’t feature much in my thinking. It always seems to happen after the good times, the best times. We have just been on a trip away from home, for two nights in a hotel. It was a humongous room with a balcony overlooking the sea. After a month of not being outside at all, I could see the horizon again. I had a massage which was indulgent and relaxing. I watched the people come and go as I sat waiting for my massage and thought to myself that I looked normal, that these people couldn’t tell from looking at me that I spent most of my days in bed. I ate creme brûlée. I saw penguins and seals. I laughed at my boy, and spent quality talking time with my husband. And now I should be grateful, but I feel profoundly disheartened. Most of the time you survive this illness by telling yourself it’s okay, this is normal, really, and there are worse things, and you could be worse off, and I could be bedbound, or not have my husband and baby – and wouldn’t I rather have those things than be perfectly healthy? And of course, I would. But then there are the times when it just strikes you again: this is not normal, this is not okay. It is not okay that I have to measure out my activities in teaspoons, that I have to miss friends’ weddings, that I cannot play games and run with my boy, that I cannot go to church, that I can no longer sing, that I am not doing ministry, that I am just never, never getting better. I am home now, and already my body is aching with the strain of the fun of Christmas and the time away. My heart is clunky and erratic, my muscles painful and knotted. And I am tired – so tired. This is the ‘payback’ of pushing things, even a little. I am bored of being ill. I am weary of it. Today this does not feel okay. I cannot cook for myself, but I can still buy boots. I can wear boots, and when I leave the house I will have new boots. And then I consider, is it even worth buying them? My rule of thumb, post-2010 relapse, has been to do a maximum of one thing a day, and aim to leave the house for an hour or so once a week. But major relapses since then have shown that even this is too much. I need to rest more. My rations are probably more like one thing every other day, leaving the house once a fortnight. So that means this year I will leave the house maybe 26 times, and most likely only wear those boots approximately 15 times this year. It is foolish, ridiculous even, to buy a pair of new leather boots, simply because I love shoes. They will get so little wear. It is an extravagance. I should not buy them. I have to be frugal, like this, with pretty much every area of my life when it comes to time and energy expenditure. Going over-budget on fun things for a day can cost weeks and months in a relapse; it’s not worth it. Have I gone out for a meal last week? Then for the next two weeks I need to talk to friends twice a week rather than four times a week. I go back to the website and select ‘dark grey’ and click ‘buy now’. Sometimes all you can do is buy the ridiculous boots anyway. Lady you ARE doing ministry right where you are on the blog & in twittersphere. Both places would be poorer without you. Thank you for honestly sharing your heavy heart and showing us how we can try to ‘put ourselves in your boots’ and walk with you. Thank you so much for your lovely words of encouragement. I really value them. Thanks for cheering me on. Dear sweet Tanya, this moved me tremendously. 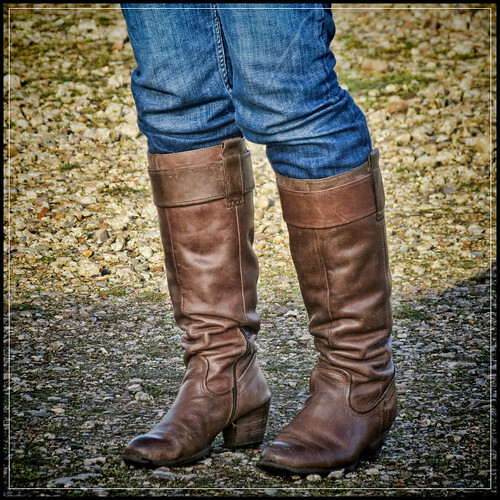 I share the joy of your decision to purchase the boots! As a fellow M.E sufferer these are issues we face on a daily basis. To do or not to do? Do we decide on the basis of how we are currently situated or with hope for the future? I love shoes/boots too and delight in buying them – usually from catalogues. Yet they languish in their boxes (or under a chair truth be told) most of the year and seldom get an outing. But my heart leaps at the thought of the one day when I may be enabled go out again and walk ‘properly’ in them. So it is an act of faith we exercise. A defiant fist shake at this weakening and limiting of our bodies and lives. And we live with the ‘tomorrow thoughts’ to encourage us to get through today. Chronic Pain and Fibro which was changed only last year from M.E. I am my own worst enemy I plan things knowing that there is a good chance I will have to cancel but not planning makes me feel like I’m giving in. Yet over 7 years into this illness you would think I would have learned but I am a slow learner it seems or to quote the Dr, self destructive. I’m so glad you brought those boots and I pray that you get to wear them more times that you dreamt. I missed you the time you were away and prayed that Pappa would keep you okay. Lovely to have you back in the land of bloggers. Your post brought a deep sob to my throat and I am battling tears now for I know, dear one, … I know… . I am also in the battle zone with my heart and emotions at the moment. May Pappa grant us grace upon grace, upon grace. Hi Tanya…Good to be back here with you after all the Christmas hoopla. You do sound very weary, my friend. So glad you pressed ‘buy now’ for the amazing ‘dark grey’ boots. I was hoping you would. And I’m more than glad that you are here, using your voice in your unique way, to speak to people like me. God Bless your heart. Thanks so much for your encouragement and for rooting for the boots! I really appreciate it. Lovely post Tanya – and echoes how I, and I suspect most people with ME are feeling at this time. We went away to see relatives. It was lovely, but they have no idea how tiring it is – and how ill it makes us. One set of parents exhausts us by talk loudly, often shouting (nicely) from room to room – the other invited a handful more relatives for a celebration dinner. I spent most of it lying on my bed, trying to find a way to get through this ‘ordeal’ , when it should have been a fun occasion. We got back 5 days ago, and it is only now that the true effect of our exertions have hit us. The littlest thing is so hard to cope with – my husband who is normally so strong and in control was in hysterical tears this morning – the battery in the car is dead and we don’t have the energy to get the charger out and hook it up. It seems such a little thing, but he felt so helpless, that even this little task was beyond him. Now I have to comfort him, and somehow find the energy to cook a meal, or we won’t eat tonight! The idea that there will be energy for really living seems a long way away. Anna, it’s my heart goes out to you and Phil knowing how active you would like to be. You have such a generous spirit and I’m pleased to be a good friend of you! Good post Tanya. Possibly one of my favourites that you have written. Wendy is right – you have a fantastic ministry online and by sharing your story you are connecting people, encouraging them and showing them the reality of real life. I’m glad you bought the boots. I was rooting for you to do it. Thank you for this hard insight into your life. One thing though, don’t discount the ministry that you are doing just writing and sharing your heart and your struggle with suffering right here. Your life and your story matter! Well this is just exactly what I would have said if Wendy hadn’t got there first. I can only imagine the frustration you feel but I really do echo all the people who have said how important your online voice is. I am sure your online ministry is going to go from strength to strength, even if, for the moment, your body is not. Thank you for your honesty and your gentleness. Whoops – I think it is obvious but I didn’t mean to reply to Wendy, rather to leave a comment for Tanya! Wendy expressed my heart so beautifully I obviously clicked there by mistake! Thank you so much for your affirmation – I am feeling SO loved! Thank you, Wendy! You know, I so nearly didn’t post this for fear of being seen as shallow and materialistic… You and others have been so gracious in rooting for the boots! And thank you for the reminder that this is ministry. I know it is, but I do need reminding, thank you.